What is the T-TEST Function? The T-TEST Function is categorized under Statistical functionsFunctionsList of the most important Excel functions for financial analysts. This cheat sheet covers 100s of functions that are critical to know as an Excel analyst. It will calculate the probability that is associated with a Student’s T-Test. The function is commonly used to test the probability of two samples have underlying populations with the same mean. In financial analysisFinancial Analyst Job DescriptionSee a real Financial Analyst Job Description including all the skills, experience, and education required to be the successful candidate for the job. Perform financial forecasting, reporting, and operational metrics tracking, analyze financial data, create financial models, suppose we wish to understand the amount spent by Europeans and Americans on food. We cannot practically record the spending habits of every European and American, so we would take a sample of the entire population. 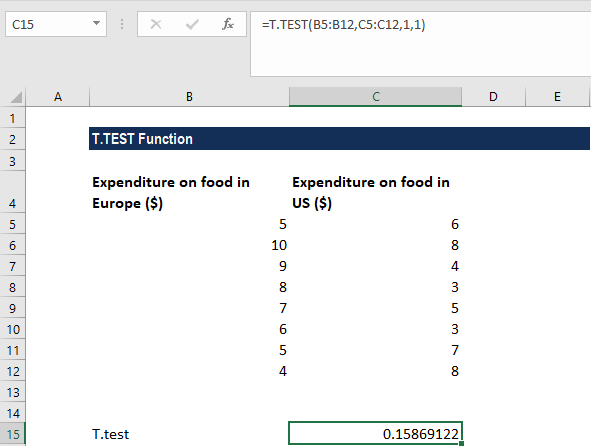 In such scenario, T-test will help us find the answer to the question on whether the difference in food spending of the two groups is representative of a true difference between Europeans and Americans in general or if it is just a meaningless statistical difference. Array1 (It is a required argument) – It is the first data set. Array2 (It is a required argument) – It is the second data set. Tails (It is a required argument) – It specifies the number of distribution tails. If tails = 1, T-TEST uses the one-tailed distribution. If tails = 2, T-TEST uses the two-tailed distribution. Type (It is a required argument) – It is the types of test to perform. 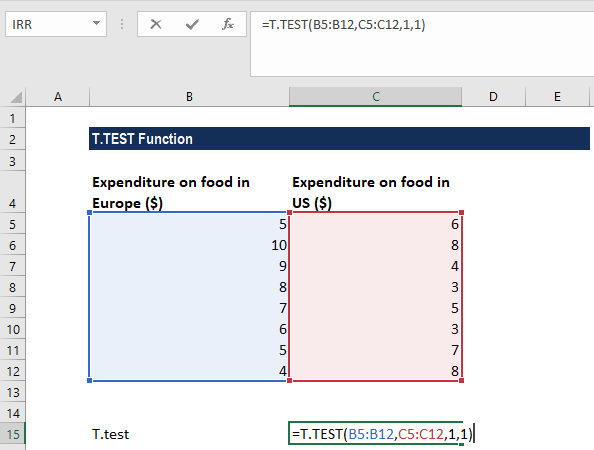 How to use the T-TEST Function in Excel? Suppose we are given the following data on the money spent by households in Europe and the US. The given tails argument has any value other than 1 or 2. The given type argument is not equal to 1,2 or 3. #N/A! error – Occurs when the two supplied arrays are of different lengths. #VALUE error – Occurs when either the given tails argument or the supplied type argument is non-numeric.